About 9 million fewer Americans will have health insurance next year thanks to the Trump administration and Republicans in Congress, a new report estimates. Congress' elimination of the individual mandate, which takes effect in 2019, and a trio of moves by President Donald Trump are expected to fuel the decrease, the Urban Institute said. 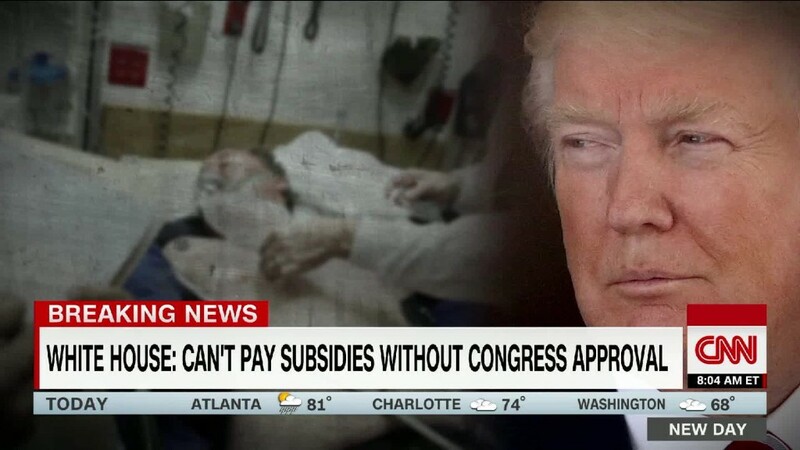 Trump's actions include the discontinuation of federal support of a key Obamacare subsidy, the reduction of advertising and assistance for Obamacare's open enrollment season and the proposed expansion of short-term insurance policies. The Congressional Budget Office does not consider consumers with such policies to be insured. The president and Congressional Republicans say they want to give Americans more options when it comes to health insurance, including the choice of whether to buy insurance at all. The individual mandate, one of Obamacare's least popular provisions, requires nearly all Americans to get coverage or pay a penalty. The CBO estimated in November that 4 million fewer people would be insured in 2019 because healthier people would be less likely to buy policies without the mandate in place. The Urban Institute estimated that the mandate's elimination, as well as the reduced federal support of open enrollment, would leave 6.4 million fewer people with coverage by 2019. Last week, the Trump administration proposed regulations that will make it easier to obtain short-term health insurance plans by allowing insurers to sell policies that last just under a year. The duration of these policies, which don't have to adhere to the Affordable Care Act's consumer protections, had been limited to three months by the Obama administration. Health Secretary Alex Azar said that short-term policies will give Americans more choices so they can find coverage that meets their needs. Rates will likely be lower for younger and healthier Americans since these policies' premiums are based on consumers' health status and the plans don't have to offer as many benefits as those on the Obamacare exchanges. About 2.5 million people who would have been otherwise insured will opt for short-term policies next year instead, the Urban Institute estimates. Combined, the elimination of the individual mandate and the expansion of short-term plans will likely cause premiums for Obamacare policies to increase an average of 18.2% next year in the 43 states that do not prohibit or limit such policies, according to the Urban Institute.